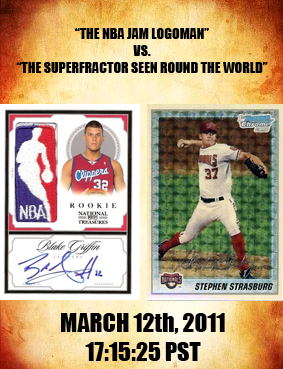 The Stephen Strasburg Superfractor has to be extremely nervous at the moment, as a certain basketball card featuring a certain slam dunk champ nears twenty grand on eBay. The card of note is a one-of-one 2009-10 National Treasures Blake Griffin NBA Logoman auto. Logoman and Laundry tag patch cards are currently among the most sought after cards in the entire hobby, when you pair that with the hottest player in the hobby and add a signature to boot, you end up with an auction worth keeping an eye on. With 4 day remaining, the rare Griffin currently sits at $18,500 after a total of 21 bids. In the process, creeping ever closer to a card that captured the imagination of a nation last summer. That card, a rare 1/1 Stephen Strasburg Supefractor from 2010 Bowman Baseball that sold for $16,403 during it's first dance on eBay, then during it's second stint on the eBay auction block sold for $25,000, ultimately the deal fell through when the winning bidder could not pay for the card. The card was then sold to Razor Collectibles Company for $21,403. If the auction goes down without any problems, the Strasburg Superfractor should definitely be worried that there's a new big shot card in trading card town (if the Superfractor some how has consciousness). Many times auctions this big require pre-approval prior to placing a bid. All indications are that the seller is serious about selling the card and is doing his best to keep bogus bids from being placed. If I had to guess, I would estimate the auction will finish between $20,000 and $27,000. What makes this card so appealing is that it has far better long-term potential than the Strasburg Superfractor did, as a slew of superior Strasburg cards came out later in the Summer of 2010. Meanwhile, the 2009-10 National Treasures Signature Patches Logoman is one of the two best Blake Griffin basketball cards in existence, with the other being his 2009-10 National Treasures 1/1 Black Parallel Jersey Auto RC.